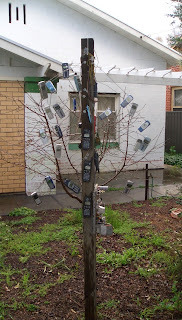 MB spotted this quirky mobile phone "installation" in someone's front garden just near last born son's place in the inner city suburb of Everard Park. MB has done some exploring of the neighbourhood and when returning some DVD's to the very nearby video library was struck by the beautiful old art deco building in which it is housed, turns out it was once the Roxy Theatre. Things have gone downhill a bit since then though, as this corner is now home to an adult bookshop, a photography shop with an exterior sound speaker playing scratchy music, which is more or less drowned out by the six lanes of continuous traffic thundering past on the Anzac Highway. There is also a travel agency that operates "by appointment only" and a pine furuniture shop. Luckily the Adelaide Farmers' Markets operates on Sundays at the nearby showgrounds, so MB was able to walk up there this morning to pick up some essential supplies, such as goat's milk feta and dried muscatels.